Well, it was bound to happen and finally has. I made a rather large ‘oops’ with a post schedule. You may be thinking, “hmm…this bread looks familiar”. Let me back up explain why it may seem like you are having a serious case of deja vu, but in reality you are not; I just goofed. One of my goals for the New Year was to carve out a working schedule for myself with everything from cooking days, to photography days and posting days; and for the most part, things have been going great. I get my posts all ready, click a little schedule button, and go about my day. Ahhh, serenity.Until yesterday. Yes, yesterday changed all of that. You see, yesterday morning I woke up to realize an incomplete post had posted and emailed out to my awesome email subscribers (I love you guys, by the way!) all because I couldn’t tell my Mondays from Sundays. Well, due to the events of the day, I wasn’t able fix it post haste so I had to temporarily take it down. Ugh. Anyway, back to the (not so big) problem at hand. I am almost relieved (but still more than a touch embarrassed) that this has happened because this is what blogging is all about. Real people, real stories, and real lives. And trust me, my real life involves tripping and stumbling…often. So, in celebration of my quirks (read: faults) I am bringing you this incredibly flavorful, wonderful and healthful bread. 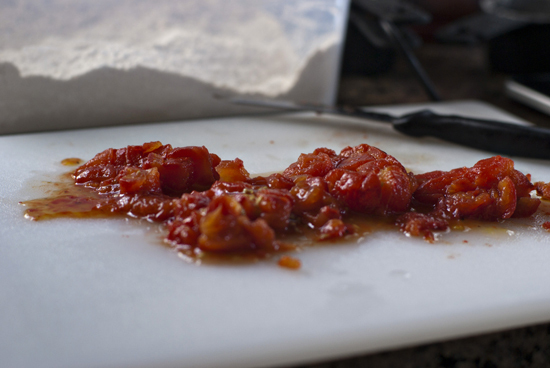 This is the last (at least so far) recipe that I whipped up using the slow-roasted tomatoes that I made a while back. 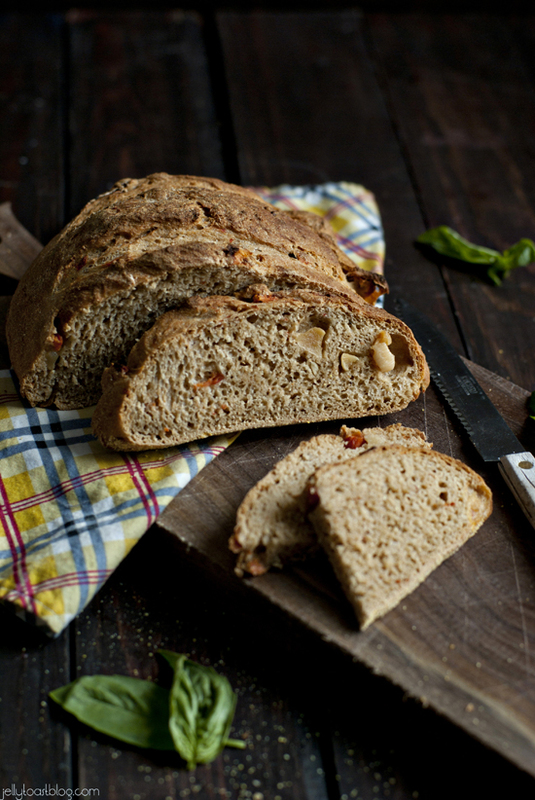 It’s packed full of roasted garlic and tomato and is a variation of my favorite, no knead bread. This particular variation makes out-of-this-world grilled cheese sandwiches and divine thick and crusty pieces of toast that are perfect for dunking in soup. Really, the roasted garlic and tomatoes are insanely good together; just floating around in the bread like old pals. I halved the original recipe for you so you wouldn’t feel like you had to make 4 whole loaves of bread. But with bread this good, you may want to anyway. Now, in hopes that I’m not the only one who is prone to errors, I invite you to please share any crazy little slip ups that you have experienced. You know, just to get them off your chest. Clearly, this is a judgement free zone. For step-by-step photos and further info about this bread baking method, visit ‘my favorite bread’ post. Add the first 5 ingredients (through yeast) into a 5 quart food safe container with a lid and whisk it until well combined. Next, add 2 cups of luke warm water (100 degrees), garlic and tomatoes; stir with spoon. 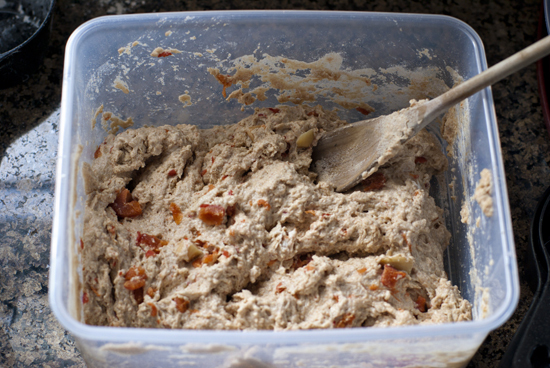 Don't knead the dough, but you may have to use wet hands to make sure it's all mixed up. Pop the lid on but don't worry about sealing it, as gases need the chance to escape, and let it rise for about 2 hours on the counter. After it's done rising, place the bucket (still not sealed air tight) into the fridge. The dough handles best after being chilled for a couple of hours. Prepare your pizza peel: sprinkle a pretty thick layer of cornmeal on the peel and spread it around a bit with your hand. This will prevent the loaf from sticking to the peel. As well as prevent a whole lot of cursing later when your loaf won't magically slide onto the pizza stone. When you want to form a loaf, remove the bucket from the fridge and sprinkle a bit of flour over the surface of the dough. For a 1lb loaf, use about 1/2 of the dough from the bucket (you can weigh the dough on a kitchen scale to be sure it's 1lb). Grab the dough gently and pull it out of the bucket. Use kitchen scissors or a knife to cut the dough. The next step is what is called 'gluten cloaking'. Sounds mysterious, but really it's when you use the loose flour that you sprinkled (and more as needed) to gently allow your hands to pull the surface of the dough over and around to the bottom of the piece, forming a ball. Be careful not to squeeze the dough too much. After you have your desired shape formed, place it on the cornmeal prepared pizza peel. Drape it lightly with plastic wrap and walk away. Let it sit for about 90 minutes. *timing tip: After you have your ball of dough formed and draped in plastic wrap, set a kitchen timer for 60 minutes. At the end of the 60 minutes, turn on your oven and reset your timer for 30 minutes. When the 30 minutes are up, it's time to finish the prep on your loaf. The 30 minute timer has just gone off. Remove the plastic wrap from the dough and gently brush the dough with water. Slash the dough by using a knife, or kitchen scissors as I did here. This helps the dough to bake up nice and pretty. If you forget this step, you may have a blow out on the bottom of your loaf. It'll be tasty, but funny looking. Slide the dough onto the heated pizza stone and then quickly add a cup or so of hot water to the broiler pan and shut the oven door. This water creates a steamy environment-kinda like a day spa-for the bread which gives it it's beautiful golden and crusty shell. Yum. At the end of the two hours, slice and spread, top or dip the bread in anything your little heart desires. It's great for rustic sandwiches, toast and simple snacking. On another note, this loaf of bread is lovely! 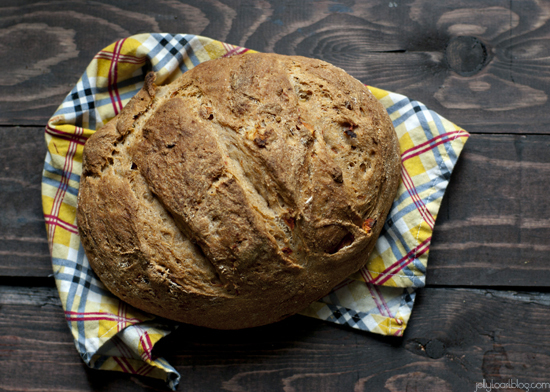 I need to try my hand at making your roasted tomatoes so that I can make this bread. I love roasted garlic too so this is definitely going to be made in my kitchen. Oh! I’m so glad it’s not just me! That is the worst feeling. Roasted tomato and garlic whole grain bread is my favorite. I always make this in free time. All my family members like to eat this recipe. It is also very easy to make and serve. Thanks for sharing.